In preparation for this exhibition I have been looking at the medieval practice of celebrating the Virgin Mary's Assumption with an offering of herbs and medicinal plants. The plants would be picked by members of the community and brought to the church where they would be laid on the altar. They would be incensed and blessed, then gathered in a sheaf to be placed in the church to ward off illness. Perhaps the folk of Romney Marsh, like those in other medieval Catholic countries, collected their healing plants and brought them to the church on 15 August to ask for the Virgin Mary's protection. 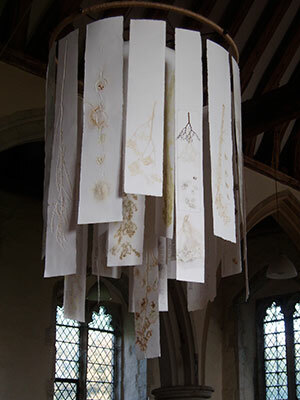 The hanging I have made for the church is a metaphor for this sheaf of medicinal plants. I have taken samples from things that are growing in the church grounds and the surrounding lanes. I also went further a field to locate plants that have adapted to the special conditions of the marsh. I have found many common plants and a few rare ones that could have been growing here when the church was built. I started collecting on Assumption Day and collected for one month. I have used the plants to create imprints that pick up the colour and texture that is unique to the plant and the time of year. I do not use inks or any other colouring in the printmaking process. The prints are the traces left by the plant itself - the essence of the plant. On the reverse of each one I have noted some of the ailments they would have been used to treat. I have also noted flowers and plants that have a religious connection, or which people brought to the church as offerings to Mary, such as the Lily and Yarrow. A few of these are included in the hanging. 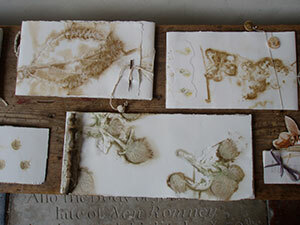 The small Pew Books allow for closer and quieter contemplation of the imprints that the plants left on the paper. For me they resemble the 'floral chaplets' held in the hands of the congregation as they waited to make their offering. The collection is neither complete, nor definitive - it is just what I could find at this time of year on the days I visited.